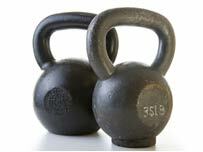 Kettlebells for a stronger leaner YOU! I have been working out for over 3 decades and recently stumbled upon a weight training tool that I have started to use during my own workouts. I have enjoyed the change and the workouts so much that I have started to use it with my clients. This simple tool is the Kettlebell. Talk about trends coming and going. This cannonball-shaped iron with a handle that is lifted with a "swinging" motion was developed by Russian strongmen in the early 1700's. This technique of "Training" has been used all over the world for centuries to build strength, balance, flexibility, and endurance quickly. And now today kettlebells are becoming ever so popular once again. Kettlebell exercises provide numerous benefits. They do a wonderful job of strengthening and toning the shoulders, hamstrings and arms. They are great for boosting your metabolism, making it much easier to lose weight. How well do they work and why are they becoming so popular again? In today's busy world the answer is simple. How about twice the results in half the time! Training economics at its finest (getting alot done with a few exercises). It brings strength and cardio training together in one quick exercise. Instead of the stairmaster or treadmill for 1/2 hour and then weight lifting for another 1/2 hour, the same results can be achieved in one 20-30 high intensity kettlebell workout. Its becoming more and more popular for both men and women. 1. It engages many large muscle groups at once. 2. "HIT" or High Intensity Training builds lean muscle fast. 3. Builds and strengthens your core. 4. Increases endurance and aerobic capacity. 5. Dramatically increase explosive power. 6. Build muscle density while you burn fat. 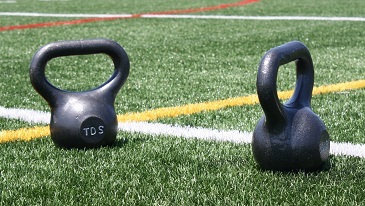 If you are looking to add some variety to you existing weight training program, give Kettlebells a try! Visit my Fitness Store to purchase your own "KETTLEBELLS", Kettlebell books and Kettlebell DVD's. Return from Kettlebells Page to Briody Fitness Home Page.